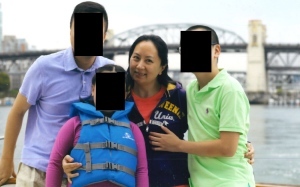 VANCOUVER -- A top executive at Chinese tech giant Huawei has been released on $10 million bail and must agree to wear an electronic tracking device while she is also monitored by two employees of a company that provides surveillance using former police and military personnel. Meng's supporters packed the courtroom for a third day Tuesday and burst into applause when the judge agreed to release Huawei's chief financial officer. The case has created tensions between Canada and China, which has warned of consequences for Meng's arrest. A sometime Canadian diplomat has been detained in China and Prime Minister Justin Trudeau said Tuesday the federal government is seeking answers about the unexplained case of Michael Kovrig, an international-affairs analyst. So far, it's unclear whether there is any link between the two cases. Meng's arrest also caused fallout on world stock markets but the U.S. and China have tried to keep the case separate from their wider trade dispute and suggested Tuesday that talks to resolve their differences may resume. On Tuesday, President Donald Trump undercut efforts to distinguish between trade talks and the Huawei case. In an interview with Reuters, he said he would consider intervening in the Justice Department's case against Meng if it would be in the interest of U.S. national security or help forge a trade deal with Beijing. According to court documents filed by the U.S. Department of Justice, Meng faces "multiple criminal charges" and each charge carries a maximum sentence of 30 years in prison, if she were convicted. After Meng's release on Tuesday, Huawei released a statement saying it has "every confidence that the Canadian and U.S. legal systems will reach a just conclusion." "As we have stressed all along, Huawei complies with all applicable laws and regulations in the countries and regions where we operate, including export control and sanction laws of the UN, U.S., and E.U." To support Meng's bail application, Martin found a number of friends and associates to vouch for his client's character and to offer financial guarantees that she will not flee. "He's a rich capitalist, he can do his functions anywhere he is," Martin said. Reading this on the app? Click here to follow our recap of the day's hearing.